In the genes: A view of Ahmedabad, Gujarat’s financial hub. Despite a marked preference among its people for direct investments in equity, assets under management in the state are on the rise. Ahmedabad: Inside Deval Shah’s eye hospital is a space sacred to him—a private cubicle from where the good doctor keeps an eye on his stock portfolio. Dr Shah says he is the quintessential Gujarati when it comes to investments. “The basic trait of a Gujarati is that I should have control over my money. I have that in my blood," he says. Dr Shah has invested a substantial amount—he won’t say how much—in stocks, but avoided mutual funds. According to V.K. Sharma, director at brokerage Anagram Securities Ltd, that’s because Gujaratis believe they understand the market. They do, he says, because “past record proves this." 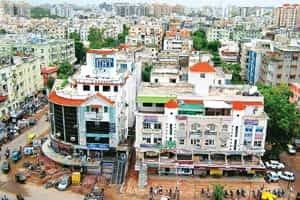 “If others (people from other states) are successful in academics and professional field, Gujaratis are successful investors," says Rajul Desai, a retail investor, who relies solely on earnings from stock markets for a living. In the past year, the number of demat accounts opened by investors in Gujarat rose by almost one-fourth. The total number of such accounts, a must for trading in shares, now stands at around 1.63 million. This number is around 15% of the total 11.5 million demat accounts in the country. Maharashtra has the highest number of demat account holders. According to Suresh Rajgopal, national head, retail and banking sales, ING Investment Management (India) Pvt. Ltd, fund managers try hard to explain to Gujarati investors that they should consider investing in less risky financial instruments. He says that despite this, their success ratio is much less in Gujarat than in other states. The only thing Gujarati investors want to know about mutual funds, he adds, is how much they return when compared with direct investments in equity. And PruICICI’s Shah says Gujarati investors are more risk-friendly and take the trouble to understand the market. “If you are investing a good amount and taking all the trouble of monitoring it, you’re bound to outperform the mutual fund manager." The soaring Sensex, the Bombay Stock Exchange’s benchmark index, has whetted Gujarati investors’ appetite for more profits on the bourses. According to Akhilesh Singh, head of wealth management, Emkay Share and Stock Brokers Ltd, this has further added to their resolve to invest directly in equities. “The Gujarati investor believes in excitement and a volatile market always attracts him," he says. That interest extends to initial public offerings, too. Since January, 85 initial public offerings (IPOs) have hit the market and raised Rs39,953 crore. Almost 60% of the applications received for IPOs come from Gujarat and Maharashtra, with the former cornering a lion’s share, says Singh. He puts the number at 40%. Gujarat, especially cities such as Rajkot, are also the hub for grey market trading in IPOs. A.P. Kurian, chairman of Association of Mutual Fund Industry, an industry body, says despite all this, Gujarat remains a key market for mutual funds. “The Gujaratis are relatively more knowledgeable and smarter investors. They always want to be doubly sure about their money. But the mutual fund industry, too, is slowly gaining ground and assets under management from Gujarat are on the rise," he adds. PruICICI’s Shah agrees. According to him, investors in the state “are beginning to realize that if you are playing with Rs10 crore or Rs20 crore in the market, it is best to take help of a professional." Rakesh Lahoti, a chartered accountant in Ahmedabad, is also beginning to see a change. Some of his wealthy clients, he says, could keep aside some of their money for investing in mutual funds.